Every year my family goes to a holiday tea. Our favorite by far is the Teddy Bear Tea at the Roosevelt. 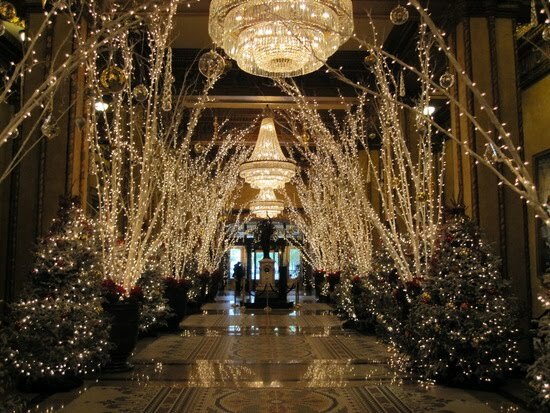 The Roosevelt is absolutely gorgeous during the holidays. At the Teddy Bear Tea, Santa and his cast of characters are there to engage in some holiday cheer! This year the kiddos got a great plate at the tea which included PB&J sandwiches and ham/cheese roll ups. My nephew RJ said the roll ups were very yummy. The adult plates this year were the best they have ever been. The quiche was AH-mazing and my family seemed to love the curry chicken salad. Other than all the sweets being a bit hit, my nephew Scottie really enjoyed the reindeer punch (sprite and cherry juice). Noah thought it was yummy as well and really enjoyed all the chocolates. At the tea there were many things for the kiddos to engage in. Mrs. Clause read a story, Santas crew was around for pictures and in total 'Nawlins fashion there was a 2nd line. For some reason, Noah was an absolute terror at the tea. It was probably the WORST he has ever been in public. It was very embarrassing. My dad even said "I think he was the most misbehaved kid in the whole ballroom!" and I'm sad to say that I'd have to agree. Whatever reason, he was an absolute terror! Don't be fooled by that angel face! 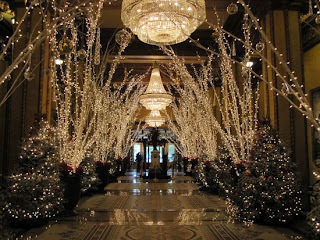 After the tea was over, we decided to walk around the lobby and go to the gift shop. Remember how I said Noah was bad? Well it went from bad to worse! Noah ran throughout the lobby running into kids, adults...you name it! The worst was him going down a ramp near the gift shop. He was running and with the decline he gained ever more speed. As soon as he was at his fastest, an elderly woman in a walker came out. Yes, you read write an elderly lady in a WALKER! I had to run and grab Noah in the hope that the woman wouldn't be run over by a terrible 2 toddler. EMBARRASSING! Once my parents decided it was time to go, I was so ready to leave. I had a great time with my family and the tea was incredible, but Noah made the whole event very trying for me. Hopefully next year he is more cooperative! This was the best picture out of 4...eeek!! !